Love and Other Consolation Prizes largely revolves around two World's Fairs that took place in Seattle in 1909 and 1962. Officially known as Universal Expositions, more than 100 World's Fairs have been held in more than 20 countries, large and small, since the first one premiered in 1851. The events showcase a country's industrial and scientific achievements, as well as highlight its culture. World's Fairs generally run from three to six months, with a major fair held every five years and smaller expositions sometimes held in the interim. During the almost 170 years since the first World's Fair, it is estimated that over a billion people have attended one. The idea seems to have evolved from English and French national fairs that were held during the late 18th/early 19th centuries to highlight the countries' burgeoning industries. The first truly grand exposition, though, came about through the efforts of Queen Victoria's husband, Prince Albert. Having a penchant for all things mechanical and an understanding of the importance of increasing trade with the rest of Europe, Albert championed the idea of a truly large-scale event that would bring attention to Britain's manufacturing sector. He created and chaired a royal commission to plan every aspect of it, including holding a contest for the architectural design of the structure that would house it. The committee ended up not choosing any of the submitted plans, instead selecting greenhouse manufacturer Joseph Paxton's design for an enormous glass and cast-iron edifice. 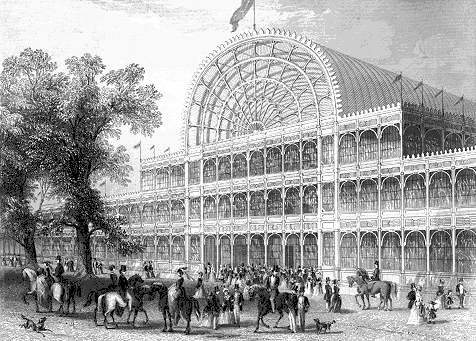 Erected in Hyde Park, London, this "Crystal Palace" was large enough to house the entire exposition and became the highlight of the fair for many. Officially named "The Great Exhibition of the Works of Industry of All Continents" it was known to the general public simply as "The Crystal Palace Exhibition" because its real name was such a mouthful. The event, which ran from May 1 through October 15, 1851, made a profit, and the proceeds were earmarked for fellowships for those studying subjects such as engineering and industrial design. Fairs soon became all the rage with some were more impressive than others. The first United States fair was held in 1876 in Philadelphia and was dubbed the American Centennial Exhibition. It featured a 1500 horsepower Corliss steam engine that weighed 700 tons and powered all the exhibits at the fair. Paris followed suit in 1889, holding an event to mark the 100th anniversary of the storming of the Bastille. The Eiffel Tower's construction was a part of this exhibition, and when completed it was the tallest standing structure in the world (although Parisians thought it was an eyesore at the time). The 1893 Chicago World's Fair (featured in Erik Larson's Devil in the White City) celebrated the 400th anniversary of Columbus's landing in the new world. Among the other marvels which made up this grand event was the first Ferris Wheel, which measured 264 feet tall and held 36 cars that could hold up to 60 people each. In 1867 the Commissioner General of the British Pavilion at the Parisian Expo issued a memorandum stating that an organization should be formed to regulate the international exhibitions to standardize their frequency. The memorandum also proposed standards for the exhibits, a standard duration and size, and a set rotation schedule between countries. The document was signed by the Commissioner General's counterparts in Austria, Prussia, Italy, Russia and the USA, and led to the eventual formation of the Bureau International des Expositions (BIE) in 1928, which continues to fill an oversight role today. Today, there are 170 member countries. Notably absent are Canada who resigned its membership in 2012 and Australia which followed suit in 2015, both citing the high cost of membership and the questionable return on their investment. The United States' membership was revoked in 2001 due to non-payment of membership fees but reinstated in May 2017. The next Universal Exposition is scheduled to take place in 2020 and will be hosted by Dubai, UAE. A full listing of past and future events can be found here. This "beyond the book article" relates to Love and Other Consolation Prizes. It originally ran in October 2017 and has been updated for the June 2018 paperback edition.